The observation on ascent from North face of Mt. Hkakabo Razi , it all based on the SPOT device location updates transmitted by ION team’s Spot device. 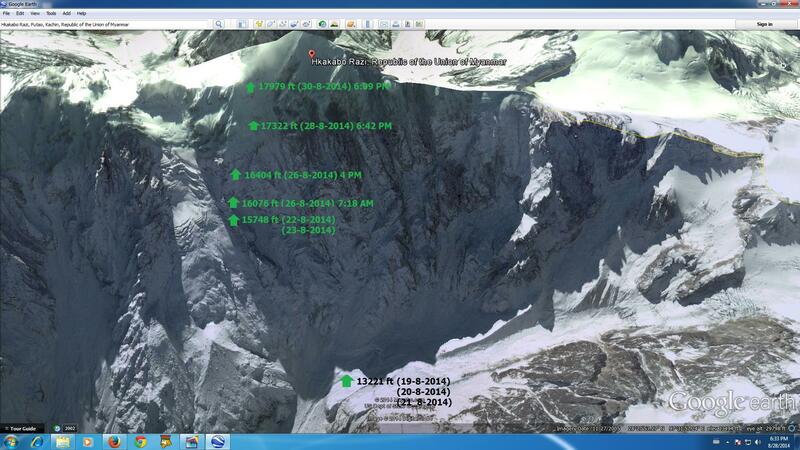 All the information source by Mt.Hkakabo Razi expedition team, and the screenshots credit to SPOT , GOOGLE MAP/ EARTH, there may be variations and errors in getting data from SPOT device with real time activities. 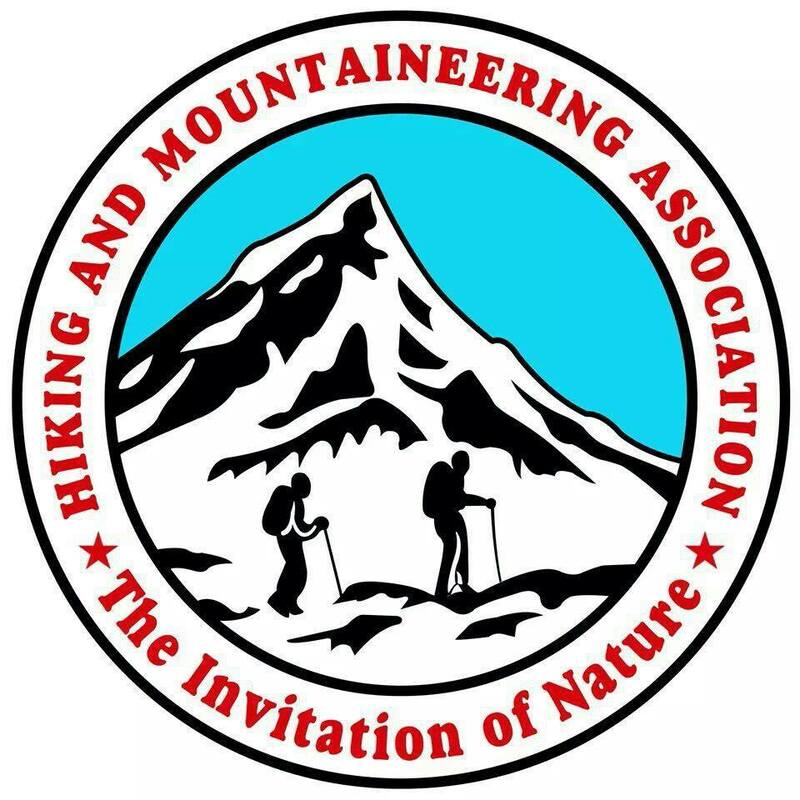 (Invitation of Nature – Mountaineering Team) ION climbing crew done Mt. Hkakabo Razi North-face ascent route. It is the most challenging route. The Northern face of Mt. Hkakabo Razi covered mostly with rock and ice, the contour line are showing it is a very steep terrain which demand technical climbing skills on the GRANITE cliffs and hidden crevasses covered by snow. 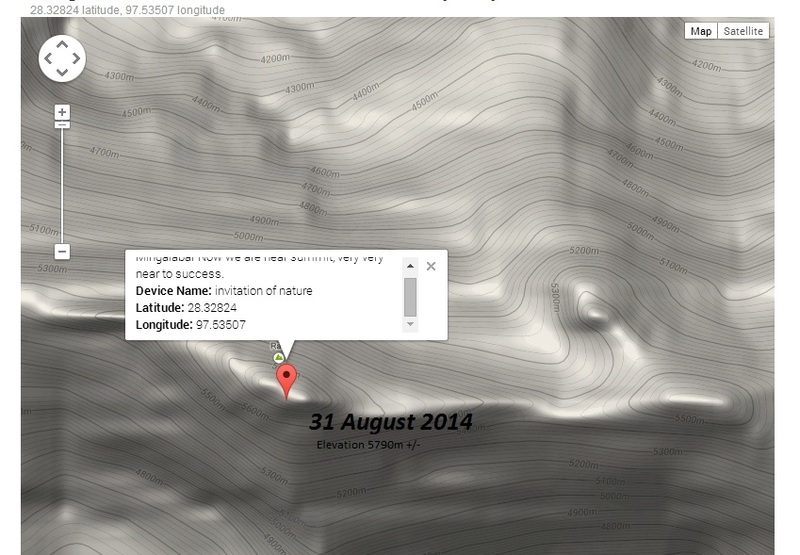 Since 14 Aug the last SPOT update from Ta Haung Damm, there’s no location update for 15/16 Aug from ION SPOT device. 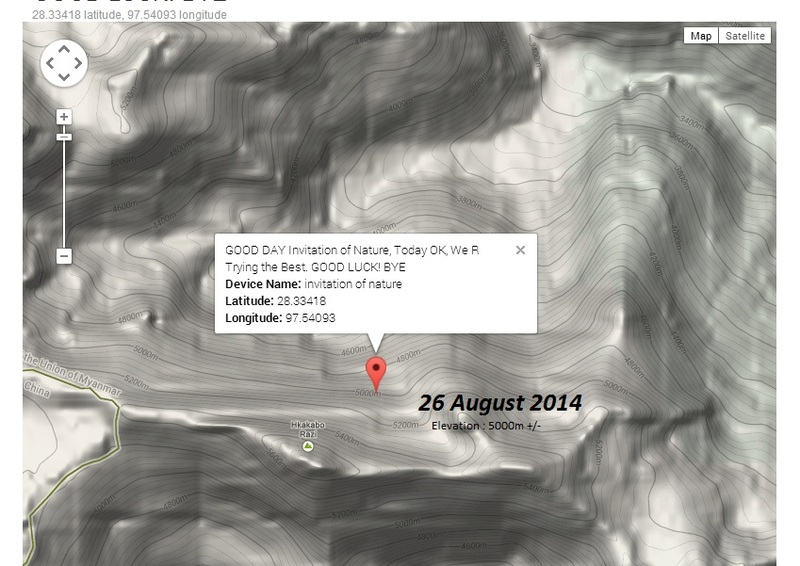 The Team reported from base camp, reaching there at 17 Aug 2014 with the SPOT device from base camp. Invitation of Nature is a private foundation founded in 2012 led by Retired Associate Professor U Myo Thant and University Alumnus. Saya U Myo Thant used to be the secretary of Myanmar Hiking Federation as well as president for Myanmar Universities Hiking and Mountaineering for years, the team members & management were based on Universities Hiking Team’s body, carrying out and maintaining the annual activities of Universities Hiking team’s trips and events by helping the universities all around Myanmar, following & trying to fulfil “Myanmar Federations” Principles and Objectives. Most of the team members are Alumni from universities all over Myanmar, mainly the core members from YANGON UNIVERSITY ( and other universities in Yangon area). ION team implementing 3 main objective thought their activities ( Mountaineering , Environmental Conservation & Humanitarian Aid). The team organize hiking training trips, Mountaineering Expeditions , and also organizing the Humanitarian Aid & Health Care programs for villages in remote area, few joint project has been done for Birding and Wildlife survey with INGO/LNGO Environmental organizations. 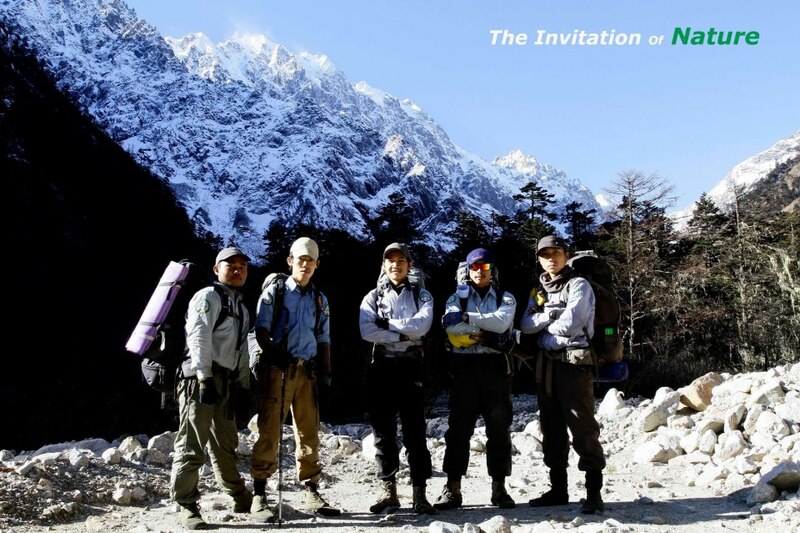 In 2012 November, ( Invitation of Nature ) team did Mt. HkaKaBo Razi base camp trip led by Saya Myo and six students, which is 175 mile hike to there. 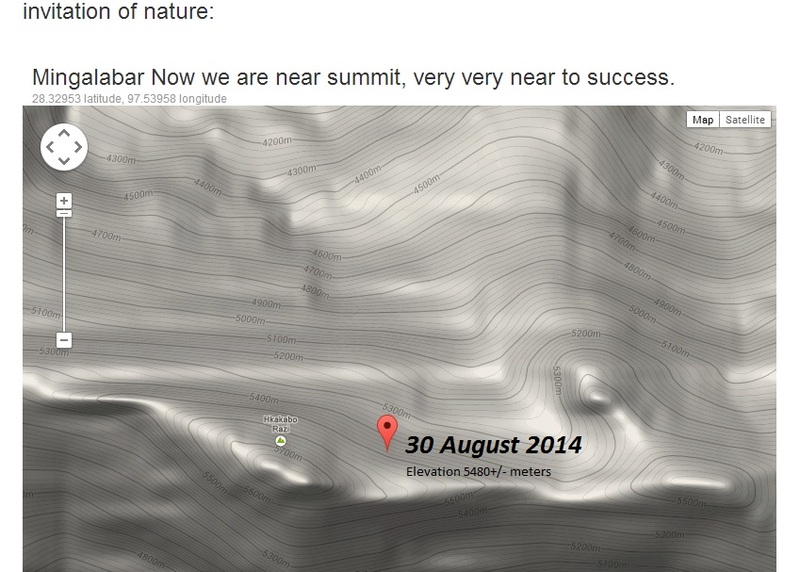 ION team gathered the all the information before this climb ( HKBo summit attempt 2014 AUGUST). The team prepared and trained for the summit attempt for two year, started training Rock Climbing and rapelling techniques, as well as weekly training and a lot of Hiking Trips including 2014 April training at Mt.HabaShan (5396m in China). I think the team spent enough days at base camp for acclimatizing for 3 days from 18 to 20 Aug 2014 and they will also have a good time for climbing preparation. 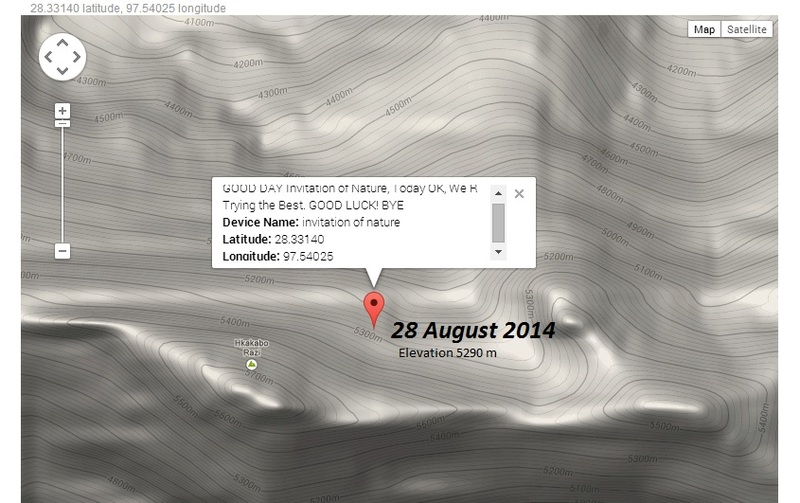 On 21 Aug 2014, ION SPOT device reported they are at Base Camp 2 (Advance Base Camp) at 13221 ft / 4030 m. Then the hard climbing session going to start on the Granite / Ice mixed wall. 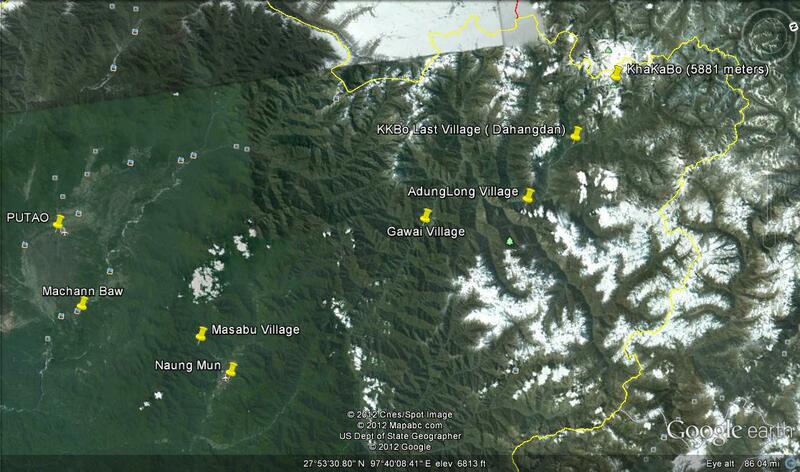 Elevation gain from Advance Base Camp 4030m to Camp 1 is about 800 meters along the slightly steep terrain. 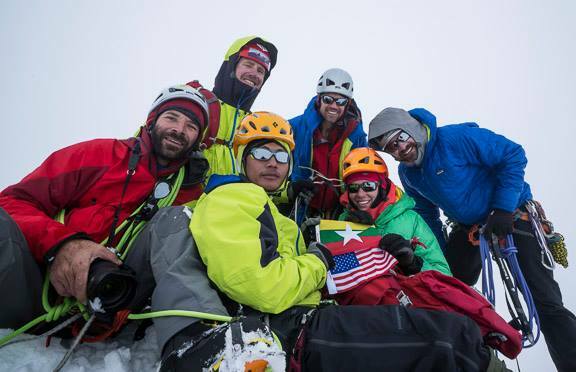 31 August 2014 (SUNDAY ) will become one of the Historic Day for Myanmar Mountaineering community.All Myanmar climbing team , successfully ascended the one of the Highest and most challenging mountain in Southeast Asia. 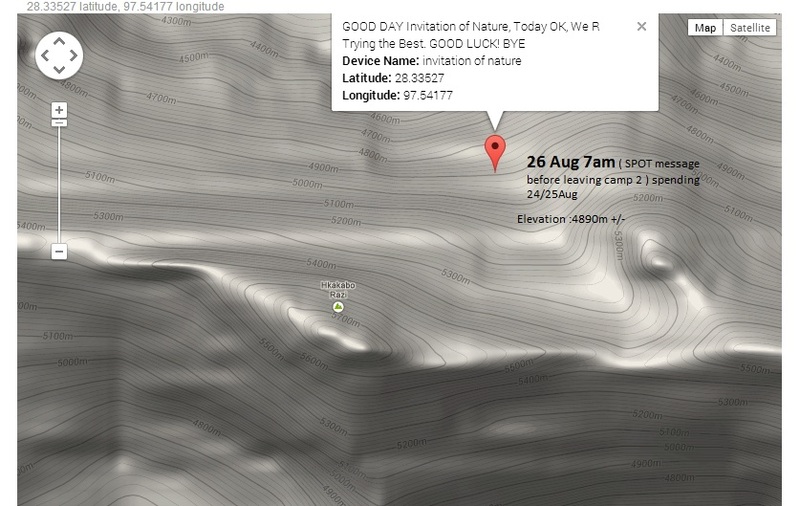 SPOT location updates for the descending route are more and more interesting. Mt.HkaKaBo descending routes are more dangerous than the ascending, terrain can be expect a lot hazard zones ( crevasses and hanging ice fall/avalanche potential etc. ). Lets wish the team best of luck for the safe descending from HKBo. (Update**** – 2 Myanmar Mountaineers – Aung Myin Myat and Wai Yan Min Thu went missing on HkakaBorazi. Million Dollar Rescue Mission is Funded by HTOO Foundation for Search & Rescue of two climbers in remote Hkakaborazi region. Unfortunately one Helicopter with 3 person on board from rescue mission crashed into forest during the mission. Out of 3 (Captain Aung Myat Toe) died during the mission “ShweYinTawGyi” & Thai Pilot “Mr. Chatchawal” were survived. Two Mountaineers never come back too. It is located in “Khakaborazi National Park” in Naungmung Township of Kachin State. The nearest airport is Putao airport (which is 1127 miles from Rangoon/Yangon International Airport). The KKBo National Park widely spread out in an area of 1,472 square miles (3,810 km2) and it was established in 1996. The park surrounds the highest summits of southeast aisa including Hkakabo Razi, the highest peak in Burma. It is in the subalpine to alpine region and the approach to Base Camp is only by Hiking through thick jungles. KhaKaBorazi has a long history of climbing attempts to its hidden summit, some of the climbing team didn’t even have a chance to see the summit because of the weather. First attempt was in 1937 , over 70 year ago, by Kingdom Ward ,an English explorer, author botanist and plant collector. Next expedition led by Col. Saw Myint Burmese Military (Yein Nwelt Parr) attempt in 1956 april. French Expedition took place in 1995 February 8 til March 12 ( returned from TahaungDamm, the last village of northern frontiers of Myanmar. Hitot Subashi University Mountaineering Club was also in 1995 February 10 til March 19 ( Madein village , KKBO climbing route finding expedition ). 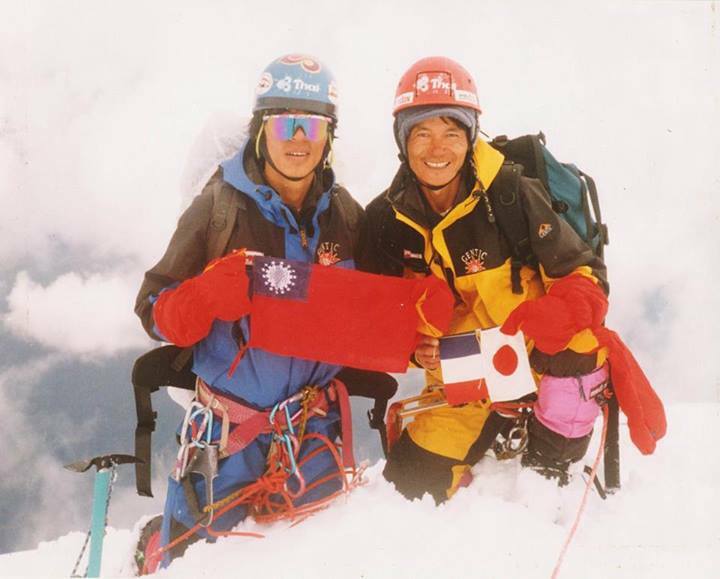 Finally , in 1996 September 15 (3:12pm) two climbers, Japanese World Class climber Takashi Ozaki and local Myanmar/Tibetan Nyima Gyaltsen (aka”Aung Tse”; from TahungDamm) successfully summited Mt.KhaKaBOrazi. 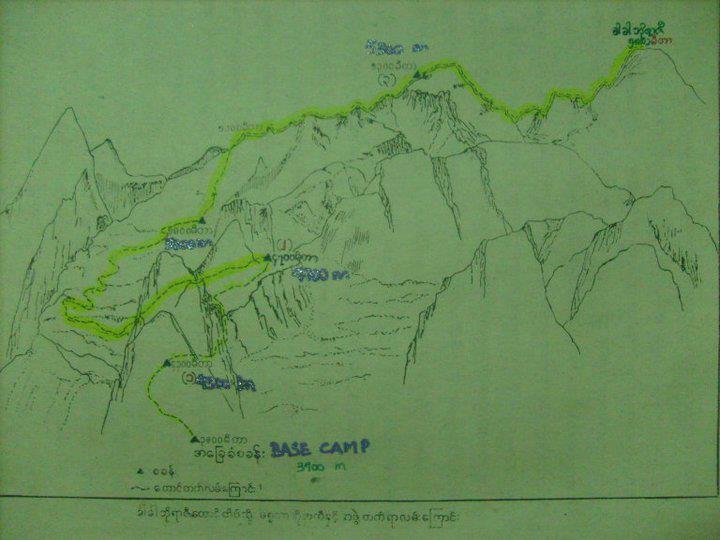 After that, it took about 16 year of no climbing in the area until 2012 November, base camp trip by “Invitation of Nature” Universities Alumni Hiking Club and Environmental Foundation. 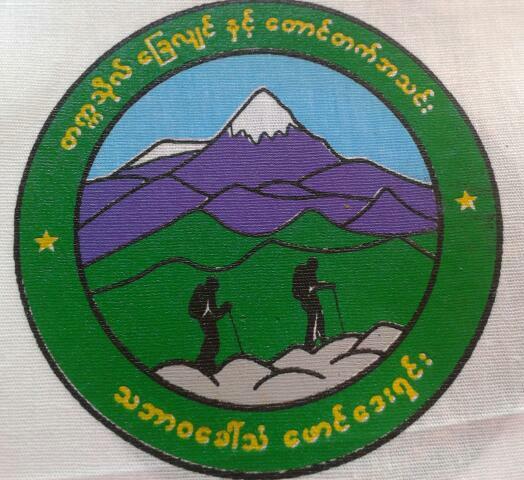 International Climbing teams need the climbing approval to climb KKBO, the climbing permit proposal needs to be submitted to “MYANMAR OLYMPIC COMMITTEE” via “ MYANMAR HIKING & MOUNTAINEERING FEDERATION” ( describing the Name of the Summit in Northern Myanmar , time of the year to climb, the approval letter from the Mountaineering Federation from respective country, number of Foreign Expedition Member, the brief climbing experience of each Expedition Member , these information must be included in the Climbing Permit Proposal) . This entry was posted in Hkakaborazi, Mountaineering and tagged Climb O' Clock, Climbing, Hkakaborazi, ION_Invitation of Nature, Northface. Bookmark the permalink. SPOT transmission from “near summit” but no transmission FROM summit? How do you know team was successful? 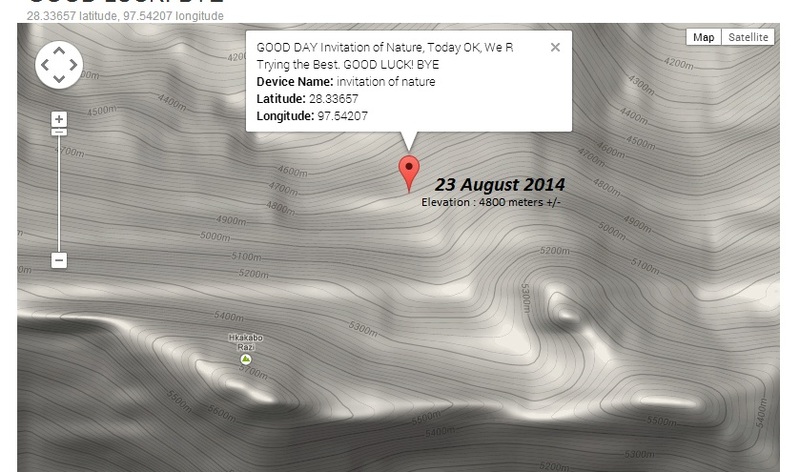 Many mountaineering teams have failed just 100m vertical from true summit. Good effort anyway. As an observer on this climb, I am not the right person to judge they summit or not, but my article describes all the information gathered as much as i can for this interesting ascent. And another thing is I am following up for the descending route as well, it has been more than 40 hour – no news from mountain, hope the team descending is fine. Thanks for your comment Dr.Cunni.